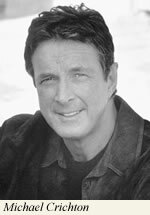 Here is a set of videos of Michael Crichton (author of Jurassic Park and other techo-thrillers) presenting at The Smithsonian Associates and The Washington Center for Complexity & Public Policy. His 60 minute talk (plus Q&A) focuses on the topics of fear, misguided predictions and the impossibility of managing the environment with a mindset of linearity. Using the environment as an example of the ultimate complex system, Crichton exposes the inadequacies of conceiving the environment as a predictable and stable system. The video is divided into 8 parts. Background material is provided in parts 1–4 and his ideas on complexity start half way through part 4. Parts 7 and 8 are questions and answers. The video is a little wonky in parts but I’m glad the camera operator was able to include the presentation slides where appropriate. Thanks to Mary Alice Arthur for pointing me to this presentation.